Shelley Bean: Funmare Before Halloween Blog Hop!!! Wooooooooo....are you totally terrified by now? Has the hop been a blast so far? Well, it's not over yet! I have more to share with you! You most likely just left the fun and frightening blog over at Nicole's. I am sure she delighted you with her cool and creative talent! So, here is what I cooked up for you today! A Paper Bag Album! I had such fun creating this too. It became a bit more involved than I had anticipated because I just couldn't stop adding more and more things to it. After I show you all the photos, I will have a video of the details of the album as well. (It is uploading as we speak...if you don't see it here yet...you will shortly). Be sure to read to the bottom because I have some very special blog candy to offer you! Without further ado...here it is!! I made the buttons on the left side using the Brad Maker by Imaginesce. The stamped images are my very own Digi images now available over at my stamp site ShelleyBeanStamps. I created many tags to slide into all the fun little pockets hidden throughout the album. The images were cut using the October 31 cartridge with my Cricut. The papers and most of the supplies used were mainly provided very generously by Paper Patch Crafts! It's easy and fun to create little photo mats with coordinating papers. 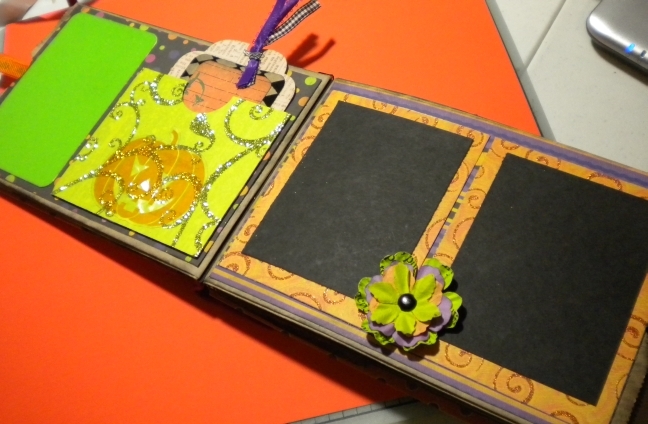 You can make your own photo corners by cutting a square scrap on the diagonal and popping tiny glue dots in each color. The photo can simply slide into the corner pockets. I learned how to make the basic's of the album by watching the how-to video at this link. So, what did you think of this album? Would you like to learn to make your own? How would you like to own THIS ALBUM? Well, that is what I am offering for my blog candy. Become a follower (if you are not already) and leave me a comment WITH YOUR EMAIL ADDRESS! And for fun, tell me what your favorite Halloween costume has been. I will randomly choose 1 person as a winner Sunday night and ship this fun little album out to the winner on Monday. 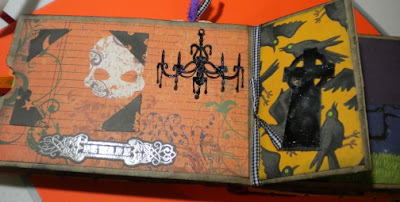 Now it's time to hop on your broom and head on over to Tammy's Blog and see what she has prepared to scare you with today!! If you have lost your way...here is the hop line up! Shelley - http://heartstring-designs.blogspot.com/ THAT'S ME! What a cute mini album! I will have to view the video to learn how to make it. Thanks for sharing. I love your album & even more the chance to win it!!! How exciting!! I am already a follower of your blog & appreciate the video of How to!! Thank you! Love the mini album. It is adorable. My favorite costume was a dinosaur costume that my sister made for my son. It was all hand sewn and had the biggest dinosaur tail. He was so cute. such a cute mini album!!! i have been toying on making one, but just haven't gotten around to it. i think that i will have to sit down & start working on one. 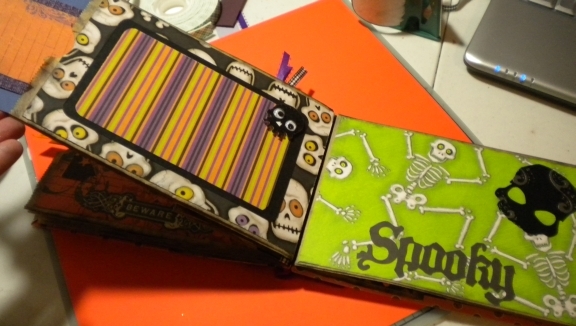 I would love to have your halloween album. I have been working on a 3d box but don't have what it takes to come up with everything all at once. Your album is fantastic and I'd love a chance to win it! What a fabulous mini. I haven't made a paper bag album yet! Thanks for the chance t win one. Such a wonderful album, tons of work, but well worth it in te end! Great job! adroable! I haven't made one in along time! thanks for reminding me of them, you've just inspired me! I love that!! I need to try this technique I am a mini album lover!! Is really beautiful!! TFS!! Your mini album is really cute! I really need to learn how to make these. I LOVE IT! Adorable mini album. Thanks for the instuctional video. This is soooooo pretty !!! This type of album is on my list but haven't done one yet. TFS Martha C.
I love this book it is super cute! Thank you for the video on how you made it! It turned out so stinkin cute! I am already a faithful follower! Thank you for participating in such a fun blog hop! Too cute, I Love it! What a cute album! Love it! Great mini. The paper, the colors, the tags, oh my. One of my fav projects on this hop. Super cute album! I love the details and I especially love the spine of that album! What a cute album! I was a punk rocker 3 years in a row in the 80's! Yes, I am a follower. and YES, I would love to win your cute album. My favorite costumes have always been the ones that the kids come up with from their own imaginations--not the store bought ones. Super cute album. Great imagination. Hi I am already a follower:-) I would love to get my little hands on that album. I love every page. Let me see my favorite halloween costume, hmmmm I would have to say I when I was a Hippie one year. Peace out man! 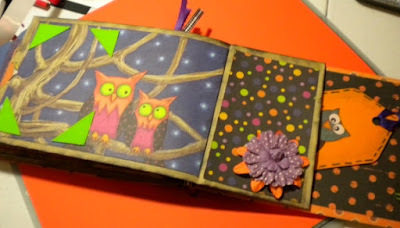 I'm loving paper bag albums right now and yours is ADORABLE! TFS! Hi...I am already a follower and look at all your projects! My favorite halloween costume was dressing up one year as the tin man. We used cardboard and duct tape.. Thank you for always being so much fun! Very nice project and prize...Thank You for being in the hop and for a chance to win a cool prize! Favorite costume was old lady! what a adorable slbum. the images are so cute. My favorite costume was a scarecrow! I love it. It is so sweet. WOW!!! THIS BOOK IS FABULOUS!!! thanks for the chance!! Such a beautiful album! My favorite costume was a princess dress that my mom made when I was 9-years-old. Love the paper bag album! I'm definitely trying one of these. Thanks for sharing! Simply adorable album I love it, I am goint o make a few of these up here soon got the bags got the paper now have the motivation thanks so much I hope you have a wonderful week. Wow! So much work went into that album. It is great! Love the album. Thanks for the tutorial. Favorite Halloween costume. . . kitty cat. Really awesome paperbag album. You are so creative! My fav costume is a medevel queen. TFS and a chance to win. This is so cute! I will have to check out the link for the album basics. My favorite costume was a Caifornia Raisin-they were so in that year. LOL! Thanks for sharing! What a cute album. I would love to win it. TFS. I'm a follower! Love your album its TOO cute! My E-dress is available on my Blogger profile. I don't like to leave it out there for just anyone trolling for addresses to swipe.... Thanks! Super cute. Favorite Halloween costume would be being a witch. Thanks for sharing and what a great giveaway. Thank you for the link on how to make this album just in case I don't win yours. My favorite costume was the year that my dad & step-mother got married on Halloween & I dressed up as Cinderella with a bucket, mop, dust cloth, etc. I wasn't the ball gown wearing Cinderella. Thank goodness she has a great sense of humor. I really like your album it is so very cute and what a great give away thanks so much for sharing with us. Very cute mini album. TFS. Love the mini album! My favorite costume was a gypsy one when I was in 4th grade. My mom made it out of old clothes, it was great! Such a cute mini- thanks for the chance to win it! 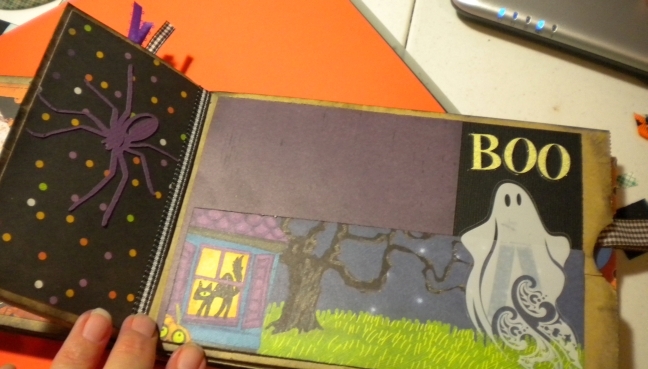 What a cute little book, you did an awesome job!!! I am having a really fun time on this Hop and seeing so many GREAT projects!!! Favorite costume.....hummm....Raggedy Ann, about 40+ years ago! Love the brightness to this album. A real treat to see. 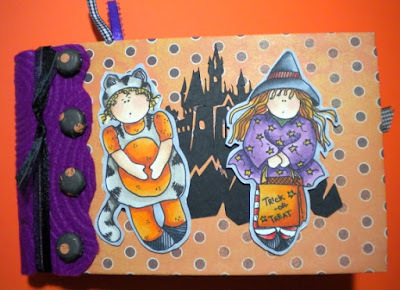 The albumn is adorable.I loved the Halloween costume I made my grandaughter several years ago. It was Ragedy Ann and she looked adorable. What a great album. It would be fun to learn how to make one. TFS. SO CUTE! Thanks for sharing and the chance to win it! I love your paper bag album! the paper you used is really cool.. TFS and a chance to win. I love this album - great job! My favorite costume has been when my kids and I were M&M's. I love this! I have been wanting to make a paper bag mini myself but haven't gotten to it yet. Yours is adorable and very nicely done! Thanks for sharing it. Great album, look forward to learn how to make one. i am a new follower. YOur paper bag album looks awesome!!! I absolutely love it. your pages look so much more crisp than mine (maybe you used a better quality paper bag?). Thank you for sharing your great work... I love stopping by! Fantastic album-you really did a "bootiful" job. I'm going to like following you! Shelley, I just love your mini album, I have made a few paper bag albums, they are so fun to make....my favourite costume was one I made for him when he was in grade 9, he was the sock monster that lived in the washing machine, we used a big cardboard box, lots of white shelving paper, and some drawing on my part, oh and an old hat with lots of mismatched socks sewn on it, it was the best costume I have ever made, so many people just loved it, he won the costume judging at school...thanks for the chance to win!! I loved your book!!! I really want to learn how to make them. I just recently began following your blog and have really been inspired by your projects. Thanks so much!